is having in the same app my #birdsite account and my #Mastodon account. Anything available? @kinsey The internet is for þorn. Hey data and visualization folks: How would you feel about a data + vis Mastodon instance with a focus on sharing, critiquing, and helping with work? Two chances for Free Software artists and designers to meet up with fellow artists and developers at Libre Graphics Meeting 2018 in Seville, and for the first time this year Southern California Linux Expo (SCaLE) will have a Libre Graphics track also! Come say hello to @GIMP devs at LGM, or my presentation on GIMP at SCaLE! 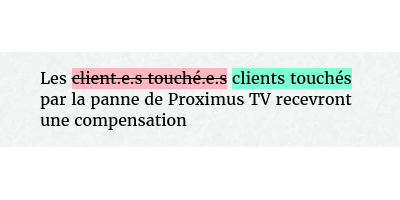 Ah tiens, Le Soir (presse belge) n&apos;est pas fan de l&apos;écriture épicène? As many other art school teachers in Belgium, i&apos;m following your blog with interest. Sometimes with the desire of a repost. I&apos;m a bit sad to find only closed source projects on your &apos;Our Other Homes&apos; chapter on your About page... What do you think about integrating also a Mastodon or Diaspora or other free software social network? #Google is indexing mastodon.social. And they&apos;ve just found this profile. I have a google alert on my name and just received the first notification about this #Mastodon account.